Gastrodia elata, a famous herbal medicine, has been received great attention on its treatments of headache, vertigo and epilepsy. Gastrodia nantoensis is a newly described species from central Taiwan with potential medicinal value. Gastrodia species are fully mycoheterotrophic orchids, and the courses of their seed development are more rapid as compared to the chlorophyllous orchids. A better understanding of their reproductive biology would provide insights into the propagation and conservation of the mycoheterotrophic orchid species. Based on the histological and histochemical investigations, we observed some notable features in ovule and embryo development. First, only the archesporial cell and/or megasporocyte are present within their ovaries at the time of anthesis. Second, their suspensors consist of a single cell and their mature embryos consist of a gradient of small to large cells. Nile red staining of a globular embryo reveals the presence of cuticular material in the surface wall of embryo proper and the lateral walls of suspensor cell, indicating that the basal wall of suspensor cell is the major route for nutrient supply from maternal tissues to embryo proper. Third, their seed coats are derived from a single integument, and lignin but not cuticular material is present in the outer most layer of seed coat and persists through seed maturation. 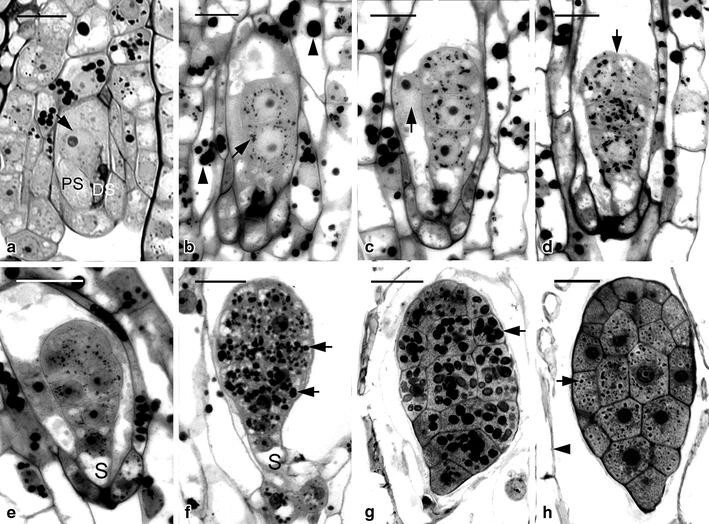 The faster seed development of Gastrodia species is due to the speedy courses of ovule and embryo development. In the mature seeds, the presence of a differentiated apical zone in embryo proper suggests the easy-to-germinate character. This study provides basic knowledge for further molecular studies on embryo development and symbiotic germination of Gastrodia species. The tiny orchid seed has a rudimentary embryo and lacks endosperm; therefore, the germination of orchid seed requires the mycorrhizal association, which supplies nutrients for the germinating seed until the seedling differentiates green leaves and becomes autotrophic (Rasmussen 1995). Although a large amount of orchids are chlorophyllous, some orchids remain achlorophyllous and reply on their mycorrhizal partners for nutrient supplies throughout the entire life cycle, and they are known as mycoheterotrophic plants (Leake 1994; Merckx 2013; Lee et al. 2015). For many fully mycoheterotrophic orchids, their growth patterns are unique. They stay underground year-round, but after sprouting, the phases of blooming and then fruit setting complete within a few weeks. The course of seed development is more rapid than chlorophyllous orchids (Afzelius 1954; Arekal and Karanth 1981). The genus Gastrodia comprises more than 50 species, distributing mainly in Asia and Oceania regions (Hsu 2008). 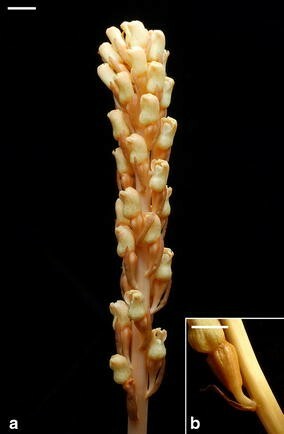 All Gastrodia species are fully mycoheterotrophic, and they are considered as the largest mycoheterotrophic genus in Orchidaceae. Gastrodia elata, a representative Gastrodia species, is an important traditional Chinese medicine (known as Tian Ma) for treatment of headache, vertigo and epilepsy (Xu and Guo 2000). Besides G. elata, there are more than 20 Gastrodia species native in Taiwan (Hsu and Kuo 2010). Some of them may have medicinal values and are under the threats of over-collection for the medicinal market. Gastrodia. nantoensis is a newly described endemic species with only a few known populations in Taiwan. As compared to the growth of stalk of G. elata, the growth of stalk of G. nantoensis is quite different. G. nantoensis has a very short stalk at the time of anthesis, and the further elongation of stalk is triggered by pollination. Although the structure of G. elata embryology has been documented in previous studies by the line drawing or paraffin sections (Kusano 1915; Abe 1976; Liang 1981, 1984), information concerning the development of ovule and embryo of G. nantoensis is lacking. For the commercial production and the conservation works of Gastrodia species, information concerning its reproductive biology is essential. Basic knowledge of seed development will assist in the improvement of artificial propagation, as demonstrated in our previous studies of Cypripedium formosanum (Lee et al. 2005) and Cypripedium macranthos (Zhang et al. 2013). The objectives of this study are to document the key anatomical events in the embryogenesis of two Gastrodia species during the courses of megasporogenesis, megagametogenesis, fertilization and seed maturity. In this study, we used the resin-embedded sections, providing high resolution, light microscopic interpretations of various developmental stages. The observations would shed light on the embryogenesis of Gastrodia species and add to the current literature. Plants of G. elata were cultivated in the greenhouse at Institute of Medicinal Plant Development, Chinese Academy of Medical Sciences & Peking Union Medical College, Beijing, China, while plants in a natural population of G. nantoensis in the bamboo forest located at Nantou County, Taiwan were selected for this study. Anthesis of G. elata occurred from April to May, and anthesis of G. nantoensis occurred from September to October. To ensure a good fruit set and seed quantity, the flowers were hand-pollinated. Developing ovaries and fruits were harvested at regular intervals after pollination. Approximately 30 developing ovaries and fruits of each species were gathered for this study. Development ovaries and capsules were fixed with 2 % paraformaldehyde and 2.5 % glutaraldehyde in 0.1 M phosphate buffer, pH 6.8, at 4 °C overnight. After fixation, the samples were dehydrated using an ethanol series, and embedded in Technovit 7100 (Kulzer & Co., Germany) as described by Yeung and Chan (2015). Serial, 3 µm-thick sections were cut with glass knives using a Reichert-Jung 2040 Autocut rotary microtome. These sections were stained with Periodic acid–Schiff’s reaction for total insoluble carbohydrates, and counterstained with either 0.05 % (w/v) toluidine blue O (TBO) in benzoate buffer for general histology or 1 % (w/v) amido black 10B in 7 % acetic acid for protein (Yeung 1984). The presence of cuticular material was detected using Nile red as detailed in Lee et al. (2006). The sections were stained with 1 μg ml-1 of Nile red (Sigma Chemical Co., St. Louis, Mo.) for 5 min, briefly washed in distilled water for 1 min, and mounted in a solution containing 0.1 % n-propyl gallate (Sigma Chemical Co.), an antifading compound. The fluorescence signal was examined using an epifluorescence microscope (Axioskop 2, Carl Zeiss AG) equipped with the Zeiss filter set 15 (546/12 nm excitation filter and 590 emission barrier filter). These sections were viewed and the images were captured digitally using a CCD camera attached to the light microscope. The major post-pollination developmental events that occurred in the developing fruits of two Gastrodia species are summarized in Table 1. Both of them have similar patterns in ovule and embryo developments. The seed maturation of G. elata and G. nantoensis only took 16 and 20 days after pollination (DAP), respectively. In several mycoheterotrophic orchid species, the above-ground part remained for a few weeks, and then disappeared (Arekal and Karanth 1981; Lin 1977). Accordingly, the seed development of mycoheterotrophic orchid species was usually faster than most orchid species. As compared to the growth of stalk of G. elata, the growth of stalk of G. nantoensis was quite different. The stalk of G. elata had elongated before anthesis, while the stalk of G. nantoensis remained short at the time of anthesis (Figs. 1, 2). It was noticeable that the stalks of G. nantoensis started to elongate rapidly by 6 DAP. 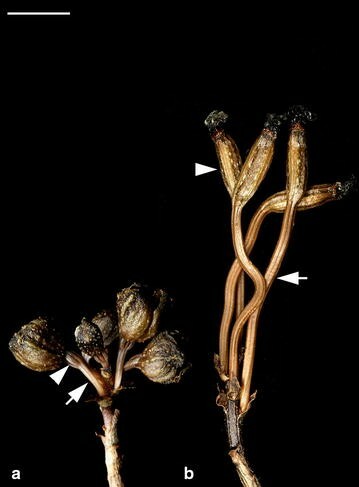 At maturity, the seeds were released from the split capsule and the stalk could reach to more than 40 cm in length (Fig. 3). In G. nantoensis, the rapid elongation of stalk triggered by pollination was helpful for the wind dispersal of seeds to long distance. In Orchidaceae, one of the unique features of ovule development is that mature ovules are usually not present at the time of pollination (Wirth and Withner 1959). The ovule development triggered by a successful pollination usually takes several weeks to complete (Arditti 1992, Yeung and Law 1997). In G. elata and G. nantoensis, at the time of anthesis, the placenta tissues were highly branched and the tip of a nucellar filament had differentiated into an archesporial cell (Figs. 4a, 5a). Prior to pollination, the archesporial cell had enlarged and differentiated into the megasporocyte (Figs. 4b, 5b). As Vij and Sharma (1986) pointed out, at the time of anthesis, three major types of ovule development could be observed in orchids. These types include (1) the ovule development has not been initiated prior to pollination, such as in Cymbidium (Swamy 1942), Dendrobium (Swamy 1943), Epidendrum (Yeung and Law 1989), Phalaenopsis (Duncan and Curtis 1942a; Zhang and O’Neill 1993); (2) the ovules contain well differentiated archesporial cells or megasporocytes, such as in Cypripedium (Duncan and Curtis 1942b; Law and Yeung 1993) and Paphiopedilum (Duncan and Curtis 1942b; Lee and Yeung 2012); (3) the mature ovules are ready for fertilization, such as in Epipogium aphyllum (Afzelius 1954), Epipactis papillosa (Sato 1974) and G. elata (Kusano 1915). 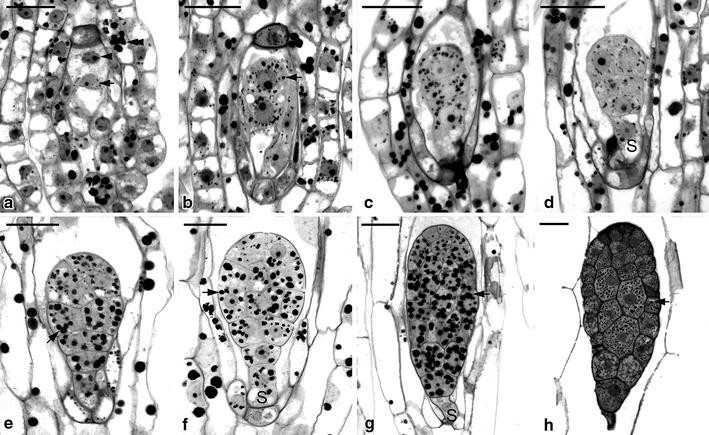 In this study, it is clear that only the archesporial cell and/or megasporocyte could be observed within the ovaries of G. elata and G. nantoensis at the time of anthesis. The developmental stage of ovule in Gastrodia species at the time of anthesis is similar to those in slipper orchids, e.g. Cypripedium and Paphiopedilum (Law and Yeung 1993; Lee and Yeung 2012). However, the seed maturity in several Cypripedium and Paphiopedilum species usually takes 6–12 months. The faster seed development in Gastrodia species is not attributed to the presence of mature embryo sac, but the speedy courses of ovule and embryo development. The changes in cell dimensions during embryo sac development of G. elata and G. nantoensis were summarized in Table 2. After pollination, the megasporocyte soon underwent the first meiotic division (Figs. 4c, 5c). The first meiotic division produced an unequal dyad: a smaller micropylar dyad and a larger chalazal dyad (Fig. 4d). The functional dyad at the chalazal end enlarged and performed the second meiotic division, while the micropylar dyad had become highly compressed (Fig. 5d). The second meiotic division resulted in the formation of two megaspores with unequal size: a smaller micropylar megaspore and a larger chalazal megaspore (Figs. 4e, 5e). The chalazal megaspore continued to enlarge and served as the functional megaspore, while the micropylar megaspore had compressed and become a thin dark-staining layer (Figs. 4f, 5f). The functional megaspore divided further and formed a two-nucleate embryo sac. The embryo sac had enlarged in size through the process of vacuolation at the center of the cell (Figs. 4g, 5g). In the mature embryo sacs of G. elata and G. nantoensis, four- to five-nucleate embryo sacs could be observed. Within the embryo sac, the egg apparatus containing one egg cell and two synergids was located at the micropylar end (Figs. 4h, 5h). In the central cell, one polar nucleus existed. At the chalazal pole, the antipodal nuclei were usually absent or occasionally one antipodal nucleus existed (Fig. 5h). The reduction of in the number of nuclei within the embryo sac has been reported as the ‘striking phenomenon’ (Harling 1950). This phenomenon has been observed in the ovule development of several orchids (Abe 1976; Arekal and Karanth 1981; Law and Yeung 1993). The reduction in the number of nuclei within the embryo sac may be due to the anomalies during the cell division process, such as the failure of mitosis, the fusion of mitotic spindles or the degeneration of existing chalazal nuclei (Yeung and Law 1997). Most of the ovules had been fertilized at 6 DAP in G. elata and at 8 DAP in G. nantoensis respectively, and the embryo development commenced (Table 1). The zygote was highly polarized with the nucleus located toward the chalazal end (Figs. 6a, 7a). In both species, their endosperms failed to develop. Within the endosperm cavity, the endosperm nuclei and the chalazal nuclei usually fused to a complex structure and it was eventually absorbed by the developing embryo. The first division of the zygote was unequal, giving rise to two daughter cells: a smaller terminal cell and a larger basal cell (Figs. 6b, 7b). The additional transverse cell division resulted in the formation of a three-celled embryo (Figs. 6c, 7c). The basal cell toward the micropylar end would become the suspensor, and the upper cells gave rise to the embryo proper. The suspensor of both species consisted of a single cell that was vacuolated with starch grains accumulated (Figs. 6e, 7e). Throughout the embryo development, no further division or enlargement was observed in the suspensor. As the embryo approached maturity, the suspensor became highly compressed and degenerated (Figs. 6h, 7h). In G. elata, an anticlinal divisions in the terminal cell of the three-celled embryo resulted in the formation of a four-celled embryo (Fig. 6d), and in G. nantoensis, the occurrences of an anticlinal division in the terminal cell and transverse division in the subterminal cell of the three-celled embryo gave rise to a five-celled embryo (Fig. 7d). Additional divisions in the inner cell tiers of embryo proper resulted in the formation of an early globular embryo (Figs. 6e, 7e). Further anticlinal and periclinal cell divisions in the inner cell tiers of embryo proper gave rise to a globular embryo (Figs. 6f, 7f). Meanwhile, a large amount of starch grains accumulated in the developing embryo proper. As the embryo approached maturity (Figs. 6g, 7g), cell division had ceased within the embryo proper, and the accumulation of large starch grains was prominent. The composition and structure of these large starch grains remained to be investigated. At maturity, the embryo of G. elata took on an ovoid shape and was only seven cells long and four cells wide (Fig. 6h), while in G. nantoensis, the embryo had an ellipsoidal shape and was eight cells long and four cells wide (Fig. 7h). Like the mature seeds of many orchids, in G. elata and G. nantoensis, most starch grains had disappeared; instead, protein bodies and lipid bodies became the major storage products in their embryos (Yam et al. 2002). It is noteworthy that the mature embryos of G. elata and G. nantoensis consisted of a gradient of small to large cells (Figs. 6h, 7h). The marked gradient of cell size in the embryo proper can be observed in the easy-to-germinate species, such as Phalaenopsis amabilis var. formosa (Lee et al. 2008). On the contrary, in the difficult-to-germinate species, such as Calypso bulbosa (Yeung and Law 1992) and C. formosanum (Lee et al. 2005), no marked gradient of cell size within the embryo proper is observed. 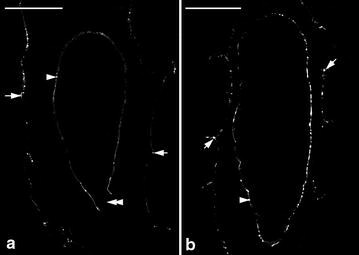 The presence of marked gradient of cell size within the globular embryo in orchids may speed the germination process. In the asymbiotic cultures, mature seeds of G. elata and G. nantoensis could readily germinate and reached the average germination percentage over 80 %. Nile red staining indicated that the cuticular material was deposited in the surface wall of embryo proper and the lateral walls of suspensor cell at the globular stage (Fig. 8a). As the seed matured, the accumulation of cuticular material was observed on the surface wall of embryo proper (Fig. 8b). Since the embryo of Gastrodia is housed within a thin layer of seed coat without the endosperm development, the deposition of cuticular materials in the surface wall of embryo proper could protect the globular embryo from early desiccation. The suspensor is a short-lived embryonic structure, and it is responsible for nutrient uptake for the developing embryo (Yeung and Meink 1993; Kawashima and Goldberg 2010). In orchids, the diverse of their suspensors provides distinguishing characteristics for a classification scheme for orchid embryo development (Swamy 1949). G. elata and G. nantoensis had a simple single-celled suspensor which belong to the type I group (Figs. 6f, 7f). It is remarkable that only the basal wall connecting to the nucellus reacts negatively to Nile red stain, while the lateral walls of suspensor react positively to Nile red stain (Fig. 8a), indicating that there is no cuticular material accumulated in the basal wall. The suspensor connects the embryo proper to the maternal tissues, and there are no direct symplastic connections between these two compartments. Therefore, in Gastrodia, the suspensor serves as the major conduit to supply the nutrients for the developing embryo proper as previously reported by Lee et al. (2006) and Lee and Yeung (2010). In most orchids, their ovules are covered by the outer and inner integuments (known as bitegmic) (Law and Yeung 1993; Mayer et al. 2011), while in G. elata and G. nantoensis, their seed coats developed from a single integument (known as unitegmic), which were composed of two-celled layers (Figs. 6c, 7c). Species with simple ovule structures, e.g. the unitegmic ovule and the lack of a distinct micropyle are common features in some mycoheterotrophic orchids (Tohda 1967; Abe 1976). It has been proposed that the unitegmic ovules might be more advanced than the bitegmic ovules (Abe 1972). After fertilization, the cells of seed coat elongated rapidly and enclosed the embryo sac entirely. The cells of seedcoat were highly vacuolated and contained several starch grains (Figs. 6a, 7a). At maturity, the seed coat became dehydrated and compressed into a thin layer that enveloped the embryo (Figs. 6h, 7h). In the developing seed of G. nantoensis, the outermost wall of seed coat gave a weak fluorescence from Nile red staining, suggesting the presence of little cuticular material (Fig. 8a, b). However, the weak fluorescence in the seed coat can be easily quenched by pre-staining of sections with TBO, indicating that a distinct cuticle may be absent (see Holloway 1982; Yeung et al. 1996). TBO is a cationic dye that binds to negatively charged groups in cells and gives two main spectra of reaction, i.e. pinkish purple for carboxylated polysaccharides such as pectin and greenish blue for aromatic substances such as lignin (Pradhan Mitra and Loqué 2014). Under fluorescence microscopy, if TBO staining causes the fluorescence quenching of the cell wall by UV-excitation, we would suggest the accumulation of lignin rather than cuticular material in the cell wall. In this study, the compressed seed coat stained greenish blue with TBO, indicating the lignified cell wall of the seed coat (Figs. 6h, 7h). In orchids, the lignified seed coat could protect the minute globular embryo at the time of seed dispersal. The present study illustrates the key anatomical events in the seed development of G. elata and G. nantoensis and identifies a number of features that are not yet described clearly in the previous studies, such as the initial differentiation of ovule at the time of anthesis, the histochemical characters of the cell wall of suspensor and seed coat, and the changes of storage products within the embryo proper. This study provides basic knowledge for further molecular studies on embryo development and symbiotic germination of Gastrodia species. LYY carried out the experimental work and drafted the manuscript; CXM, GSX and LYI provided funding, planned the study and revised the manuscript. All authors read and approved the final manuscript. This work was supported by grants from the National Natural Science Foundation of China to Shun-Xing Guo; from National Museum of Natural Science, Taiwan, to Yung-I Lee.